Again Thank you all for the great posts today. Not all people post but lots of people read these posts and based on the emails I recieved it was well appreciated. Have a great weekend and see you all at the bell Monday. I hope it is ok to talk about stocks in this thread. Using TTT I was able to buy Potash on the Canadian market yesterday at 157.00. I bought at that level since the stock was below the Buy day low and POT has a 91% positive 3 day rally. I got the rally today and was able to exit my position at 169.64, the mid range between the 2 predicted numbers. Thank you Rich for your Book as it gives me piece of mind and lowers the stress in my trading. congrats on your great trade ! Laurent, if you will respond on this blog it would be greatly appreciated or tell us the blog you will be commenting on. Ddaytrader, please let us continue to follow you here. My studies of TTT has just begun and I so appreciate your insight. Thank you and enjoy the weekend. 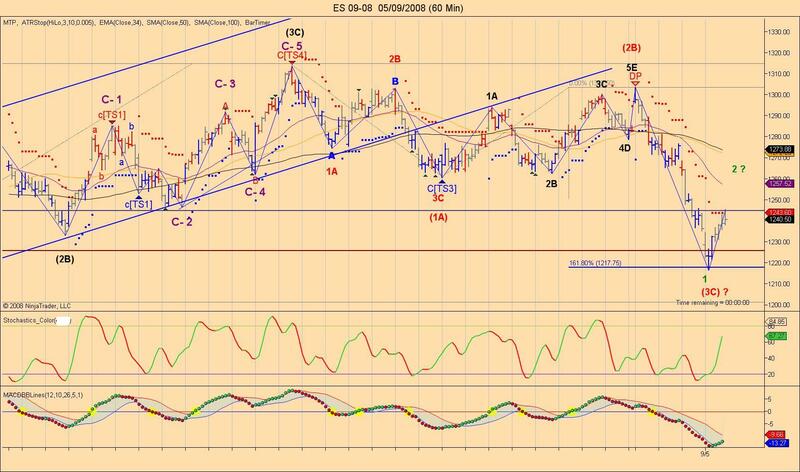 Hi Margie, welcome this is the place where I will post charts and make comments from now on. I'll be here when I'm trading. Other activites have greatly reduuced the number of days I can trade, but when I am trading I will be here. As to the other issue to which you refer, the disagreement is the result of the other person not knowing how to read Laurent's charts. Hi everyone, I will share my views on the ES as possible scenario that may unfold. 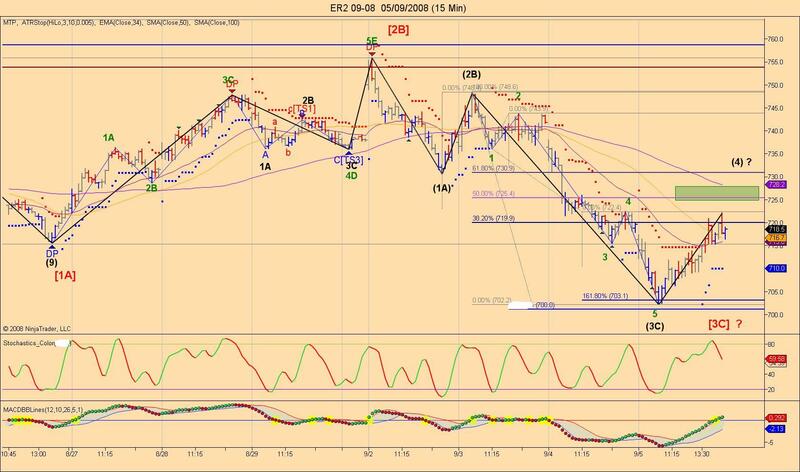 This chart shows a 60 min showing where we are at now, Friday we have made wave (3C) (red label)now the question is what the market can do at minimum the market should climb as we seem to have the first wave down (green label) completed so we are now in wave 2 and have found resistance at the previous 62% retracement as it is now acting as resistance instead of support I haven't put the retracements from 1303 yet as I want to wait Monday morning and see where the market will be. On a longer term charts we can see that the market has clearly made an ABC in wave [1A] (green label)with wave C having 5 waves then we had an ABC down for wave (1A)(black label) another ABC up that was made as an ABCDE for wave (2B)(black label)as waves were overlapping each others and have now potentially completed the wave (3C). This leg down could become wave [2B] (green label) so we have the potential for a big rise as we have achieved 1.62% of wave (1A) and (2B)for wave (3C) completing wave [2B]. This is the other possibility. So from my 2 posts we now have 2 possible scenario as I allways like 2 have both possibilities in sight so I can have a better view of the market. Monday morning I will analyze my lower time frames tick charts and see if I can find support and resistance that are close to TTT expected highs or lows. I like to trade ER2, I don't know what will happen in a week but hope it will behave the same as before when switching to the ICE exchange. 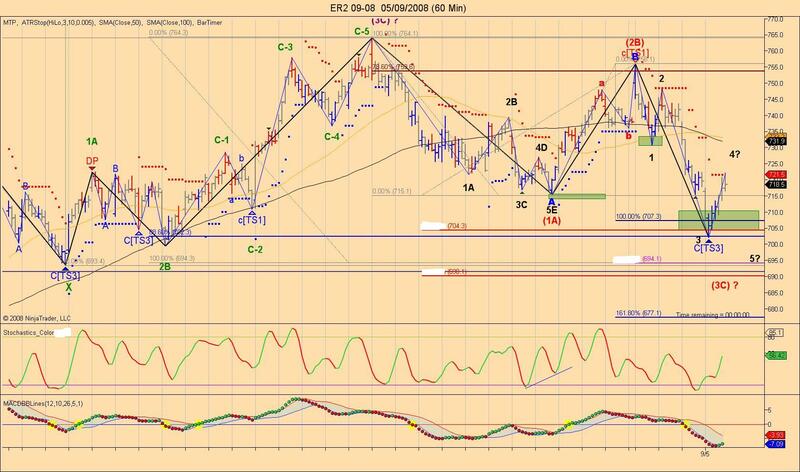 I will post a 60 min chart showing the possible wave count we have so far. 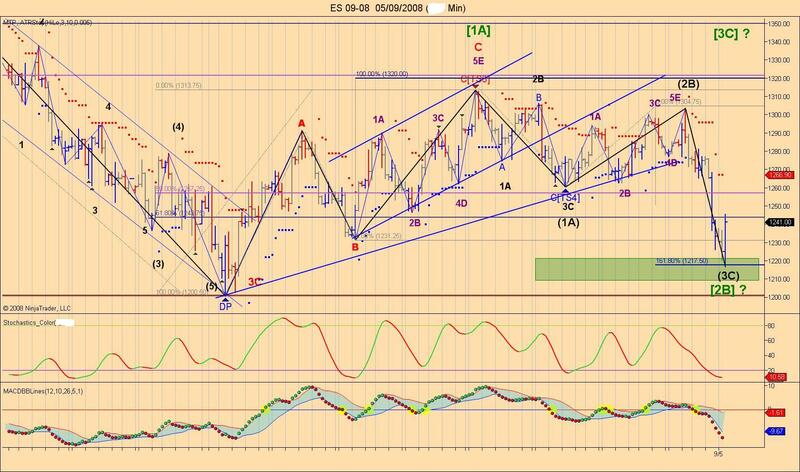 We seem to be in wave (3C) (red label)and this leg doesn't seem to be completed as we have 3 waves so far in wave (3C. You will have a better view with the next post with a 15 min chart. OK next chart 15 min ER2, we now have a better view of wave [3C](red label) we can clearly see that so far we have 3 leg downs with wave (3C) (black label) having 5 waves with wave 5 being 1.62% the length of wave 1 at 703.1, actual ow was 702.2. We are now in wave 4 and based on that we should not go higher then 730.6 as this is the low of wave (1A) and technically wave 4 should not overlap wave 1 or barely so this area is also close to the 62% retracement of wave (2B) and (3C) we might not make it there we should have a better view of the market Monday morning and like the ES I will be watching my Fib targets and TTT expected highs and lows to make a trade when or near these targets.